Jeph Loeb and Rob Liefeld have teamed up to deliver Onslaught Reborn #4, shipping this week from Marvel Comics. Amazingly, it’s been ten years since Liefeld and then-partner Jim Lee teamed up to refresh some of Marvel’s most noteworthy properties, and the publisher is celebrating that anniversary with this five-issue limited series. I’ve missed the first three chapters, so we’ll dive right in here with issue number four. In traditional Liefeld fashion, most of this book’s panels aren’t afforded the luxury of a background, and those that are given this special treatment overflow with needless winks and nods at the reader, distracting from the story and interrupting the action. A wrecked car sits at the edge of one panel, with a license plate that reads “LIEFELD.” It’s then shamelessly repeated further down the page, before the backdrops are once again left to the imagination of the colorist. Constant inconsistencies with Iron Man’s appearance, along with Liefeld’s... special... grasp on human anatomy don’t help matters. 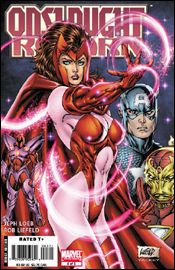 I don’t know how the Scarlet Witch gets a breath of air into that outfit. She’s so top-heavy that if she tried to stand completely upright, her spine would buckle under the pressure... but that’s the case with all of his female characters. Every moment of every panel is filled with tight-fitting wardrobe, grit teeth, painfully-overflexed musculature and squinting eyes. It’s all the worst bits of the Image Comics style without any of the personality or flair. It’s like the guy hasn’t learned anything from his rise to and fall from stardom in the mid ‘90s. His work hasn’t evolved, he hasn’t addressed the holes in his game, and without their outfits I couldn’t distinguish one character from another. I feel like I’ve been reading an old issue of Youngblood with a new writer and a different cast of characters. I’ve long been a proud Jeph Loeb supporter, but I can’t honestly defend his work here. Some of the dialog he delivers between Iron Man and Captain America in this issue is so hokey, I have a hard time imagining that he’s actually responsible. I don’t think Ant Man has an original phrase in the book – they’re all borrowed from one source of pop culture or another. Onslaught’s lines are straight out of the “stereotypical, megalomaniacal evil villain playbook,” and the good guys’ comebacks are such hackneyed, machismo-soaked garbage that I’d rolled my eyes a half dozen times before even reaching the halfway point. Even as a standalone issue, the story is filled with inexplicable holes and coincidental pauses in the action. Battles screech to a halt so characters can deliver their monologues on cue. Villains reuse the time-honored tradition of assuming their plans will succeed before they’ve actually begun to execute them. I don’t even know what happened at the end of the battle between Onslaught and Captain America. It’s the sort of story that punishes its readers for trying to think for themselves. Everybody probably has a book like this one in their collection somewhere, even if they’re too embarrassed to admit it. It’s an issue produced with little attention to detail, minor personal investment and every intention to look hip, smart and cool on the big stage. Loeb left just enough room for Liefeld to slide in three or four two-page spreads, which have long been his specialty, but beyond that there’s really nothing worthy of your attention here. If you're looking for something with even a shred of substance, steer clear and raise your head up high. Onslaught Reborn is exactly what you'd think it would be. Skip it.